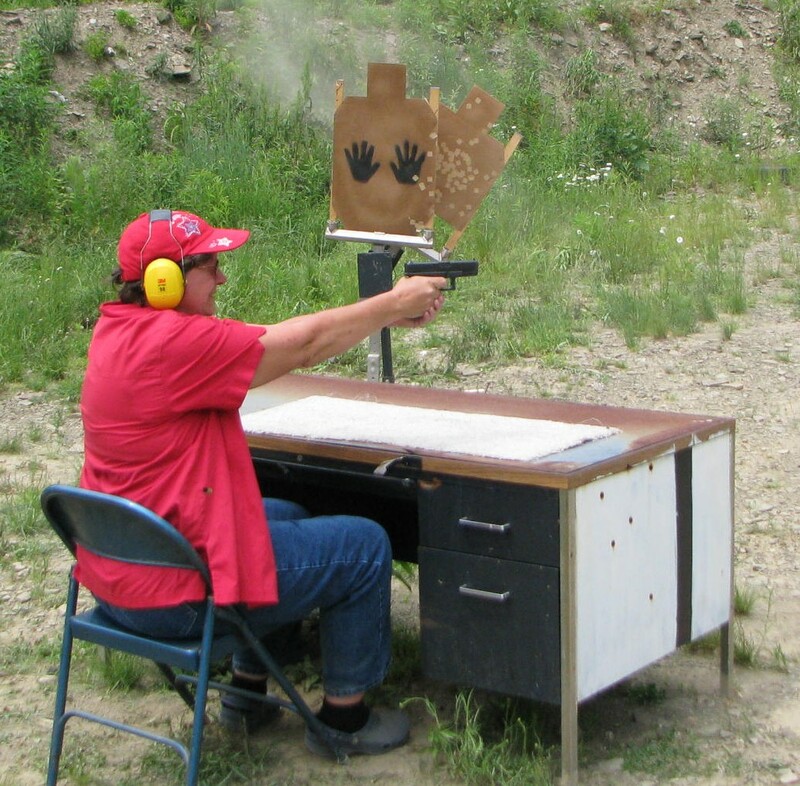 Guest post by Kelly P.
Many women enjoy target shooting, but I have found something even better – a fun and practical shooting sport called IDPA. IDPA stands for International Defensive Pistol Association and is a shooting sport that simulates real life self-defense scenarios. Shooters use full size weapons and holsters that are practical for real life concealed carry. All you need to compete is a handgun, strong side belt holster, magazine/speedloader holder, cover garment for concealment, and eye and ear protection. I have been shooting in IDPA matches for a year now. Notice I didn’t say “competing”, because I am still far from reaching a competitive skill level. IDPA is a friendly sport and beginners are always welcome. I’m not sure if this is true everywhere, but in my area kids are also welcome. Experienced shooters are friendly and encouraging and happy to share tips and discuss equipment and gadgets. At a match, shooters are assigned to squads and are under the direction of a Safety Officer. The SO runs the squad and gives all the range commands. A match consists of several stages. In each stage, the SO reads a scenario and explains the requirements for that stage. There are instructions for the order of shooting targets and how many rounds in each target. For example, you might need to put two rounds in the chest and one round in the head of each target, from behind cover or while moving to cover. You might have to shoot with just your strong hand or just your weak hand. Some targets are marked “non-threat” and partially block targets you need to hit. Most targets are fixed, but some swing back and forth so they peek out from behind non-threat targets. Some targets only face the shooter for a couple of seconds and are activated by shooting a steel target. It is a challenge! Scoring is based on a combination of speed and accuracy. Your total shooting time is recorded and points, which are converted to seconds, are added for misses, hits on the target but outside the designated areas, hits on non-threat targets, and procedural errors such as shooting targets in the wrong order. 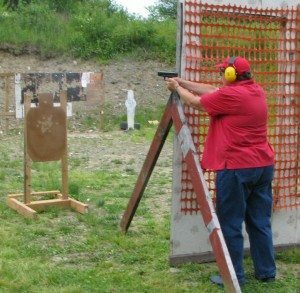 You can find a club that sponsors IDPA matches on the IDPA.com website. Be aware of the range’s safety rules before arriving. Even if you have a concealed carry permit and normally carry a loaded gun, if it is a “cold range”, you may only have a loaded gun on the firing line under the SO’s supervision, and you may only handle your gun in designated areas. If you can’t find a club with IDPA matches near you, check out IPSC (International Practical Shooting Confederation, ipsc.org) and USPCA (United Practical Shooting Association, uspsa.org). I have not shot in their matches, but they are along the same lines of using practical shooting skills. You can find YouTube videos to get an idea of how a match works. The events really get your adrenaline pumping, and it’s a great way to meet new people and gain important skills. That sounds good and I wish such a thing was available in my area. As an NRA firearms and self defense instructor, that would be a wonderful next step for my students. Unfortunately, we don’t have the population numbers to even begin to support such a thing where I live. I am curious why the emphasis is on “concealed” in IDPA? Many of us, and many more each year, carry openly and certainly should have as many opportunities as anyone else for this sort of training. In any event, I would also encourage anyone who carries a gun to remember the vital importance of dry fire exercises, both to practice gun handling skills and other tactical necessities. It is something far too often neglected, even by those who train often and well otherwise. Check out Front Sight in Nevada for some great traiining. I just got back from my second 4 day defensive hand gun course and it was awesome. Thanks for the suggestion. I have thought that I need to improve my pistol shooting skills but was, I confess, somewhat intimidated by what I assumed would be the “hard chargers” at the events. I think I’ll look in to this and see if there’s something in my area. Peace. IDPA is what IPSC was. I quit IPSC years ago when it became a space race, with people showing up with long slide, recoil compensated, low velocity/light spring, “Race” guns. The courses are geared to a much higher level, with multiple magazine changes involved. IDPA still lets you have fun with the gun you might actually be carrying when you need it. I think the emphasis is on concealed b/c 1) more people carry concealed than open carry and 2) I imagine it’s much harder to draw from a concealed position on your body than a visible one. I’m still waiting on my CHL to get here, so I’ve not drawn from a holster ever, but that just seems to make sense. I’m looking into a Crossbreed Supertuck and plan to start shooting IDPA as soon as possible! I just have to chime in. My 10 and 12 year olds Love shooting. it’s funny to see them jimmy’d up a tree brushing out there hair and picking milk jug lids tree off stumps! I’ll find some pic’s or take more and post them on my site.